I'm not quite sure why I agreed to this, but I'm happy I did. This hit the right note that I needed at the right time. Very rich and reminiscent of a good fairy tale, it's told from first 2 points of view then picks up a third closer to the end. Our main p.o.v is Nin our protagonist and I kinda fell in love with her voice from the start, she really reminded me of Alys from Dragon's Bait by Vivian Van Velde. They share similar circumstances and their voices felt the same and I absolutely loved Dragon's bait so when I realized Nin's story sent her on a similar journey I was so happy to read. This is the grown up version and of course there is a Mage instead of a dragon and this isn't about revenge, but the loss of home and family is similar and finding their way and learning that they are stronger than they originally thought, well, this story had that lesson in spades. It was a quick read, that was humorous, entertaining, filled with magic and a few of the crazies (as always). The mystery kept you intrigued but really I was here for Nin and the Mage. I loved the povs we got. The characters shared enough to create the world for us but not so much that we were bored. The world building was done is such a way as to let it unfold for us the same as it did for Nin, as she learnt more about the world she inhabited so did we. The plot moved quickly and the pacing was perfect, sometimes with time jumps to allow the story to move quickly. I know for me there were times they mentioned things and I was like *sob* no that's too long off, but Daisy did a good job of making it all work. 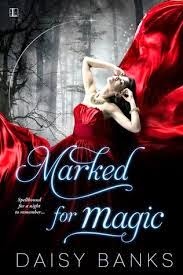 I really enjoyed the use of magic and the glimpses of healing, & ritual and their mythology we were given. I really loved how herbalism was shown and made so simply beautiful. This however isn't a perfect world and we learn that along with Nin in a particularly scary moment for her. I loved the Mage, seen as a scary person for Nin, she's filled with trepidation but knows he's her last chance at survival, if he didn't take her in then she was doomed to wander the woods. I hoped that he would be a kind man, but he was a hard taskmaster with reason, both for his and Nin's sake. We learn his name as the story progresses and he moved form being the Mage to (well I'll let you learn it with the story because it changes who he is in the story), he wasn't amused at having a girl dumped on his doorstep, especially because he considered the practice barbaric. I loved that he was smitten even though he didn't want to be and that he had some tricks up his sleeve to help make her just a student. I laughed at that pretty hard actually because Yeah too funny. I loved his sense of humor and his sense of honor. He had me cracking up when he tried to save face and even when he tested Nin. When he realized Nin was the real deal he made some decisions on her behalf and she wasn't amused in fact she became stubborn. I loved the way they interacted with each other and the way he tried to teach her. We get introduced to new characters because of the Mage's choice and we really get to see the world and Nin's growth explode. Under new tutelage Nin really blooms as a character and I really loved the new glimpses we got of her. I loved the love story that developed and how sweet the two characters were when they were together. I found myself rooting for them as the story progressed and feeling so sad as circumstances conspired against them. I loved the way the characters interacted and while the story was a bit bare bones in many ways, we got the most important parts and I loved it for that. The story was written in a way that gave you the reader a chance to imagine as much or as little about the surroundings as you wanted. I loved being able to picture it as she wrote it along with some of my own flares along the way. I just really enjoyed reading and was kinda disappointed when I got to the end, because well it's the end and it appears to be a standalone, so no more Nin and the Mage. I loved how they bloomed as a couple, and as individuals. I loved that the characters did grow and change and that they were so fun to read. This is a world I wouldn't mind returning to again & again, as we got glimpses of great characters who had some good story lines within this one. Want a taste?? Daisy shared this excerpt on her blog and I thought you would enjoy it as well. What could he do with her? Gods of the water, why him? He scanned the streambed for shells, picked up a handful, and rolled them in his palm as he thought through the problem. One path offered a solution, and she would never know. A glamour to change her appearance. With her charms disguised, he would be able to teach her, and those pert little attractions wouldn't get in the way. He skimmed a stone down the stream. Yes, it might work, so he wouldn't be distracted. Perhaps, when he took her to the castle, he might be able to persuade Lady Cassandra to take her. Even though it was late for Nin to join the other students, it might be a possibility. If she’d been found earlier, she would be in Cassandra’s care, learning from her skills. He closed his eyes. This was the best idea he’d had since yesterday afternoon. Cassandra would understand the problem. She could take Nin out of his life, at least until his maiden developed her skills, knowledge, and control. When had she become his maiden? He couldn't tell, but after today, he’d never see her as a grubby little wench again. He’d need the stepping skills of a sword dancer to avoid her snare. Tilting his head back, he looked up to the clear blue sky as he tried to work out what he truly wanted. The spring birds soared and circled, and no answer came to his questions. It seemed he must improve his self-awareness. Scraping his hair back, he tied the leather loop back in place before making his way to the tower. By the time he walked into the kitchen, she had set dishes out on the table, ready to serve the food. From the look of her, she’d found peace with her sorrow for now. One eye still on her, he trickled the shells from the stream into the small jar where he kept his collection. When she turned to stir what was in the cauldron, the glamour cloaked her. She moved to the table with the pot. He stepped back in surprise. Oh! Perhaps he’d been a little extreme, but he’d get over it. Now, her image could not tempt him.